Host and creator of Kaddish the Podcast, Ariana Katz tells us the story of Rizpah. Appearing in 2 Samuel, first as a sexual commodity and later, as a fierce advocate for the dignity of her sons. Rizpah is the foremother of shmirah, the Jewish custom of guarding the dead between time of death and time of burial. Ariana is here to tell us why Rizpah is a role model for us today. Ariana is the host and creator of Kaddish the podcast. Ariana is training to become a rabbi at the Reconstructionist Rabbinical College in Philadelphia. She is a member of the Philadelphia Reconstructionist Chevra Kadisha (Jewish burial society), a volunteer chaplain and board member at Planned Parenthood of South East Pennsylvania, and a member of the Jewish Voice for Peace Rabbinical Council. Ariana is in training to become a soferet, scribe of sacred Jewish text. 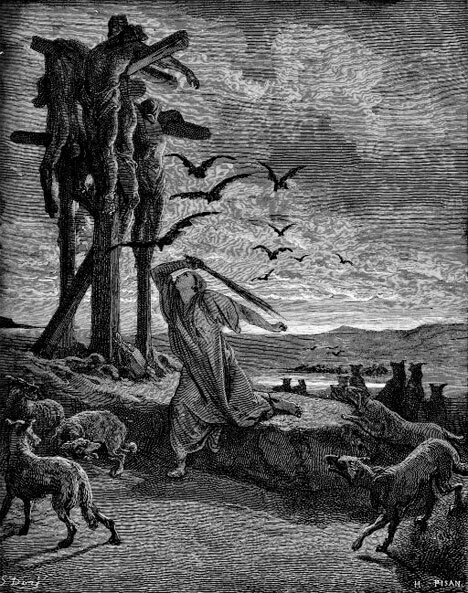 A furious mother stands at the foot of seven crucified men, swinging a stick, arms raised, as she fights off an attacking vulture. In the background, more birds of prey circle. The clouds are foreboding, but she stands determined and livid. 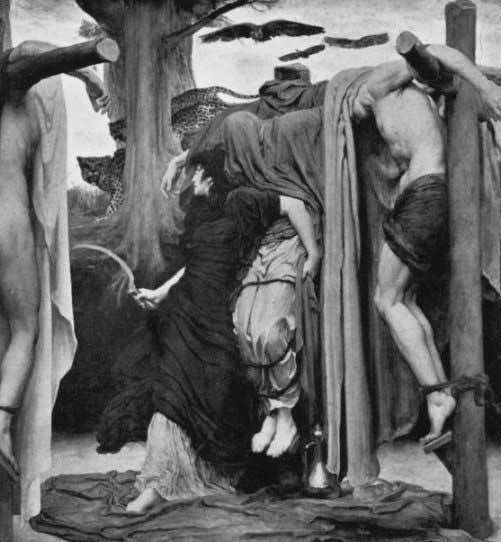 This is Rizpah, as depicted by George Becker in 1875 “Rizpah protecting her sons.” Rizpah appears in 2 Samuel, first as a sexual commodity and later, as a fierce advocate for the dignity of her sons. Rizpah is the foremother of shmirah, the Jewish custom of guarding the dead between time of death and time of burial. We first learn about Rizpah in 2 Samuel chapter 3 as one of Saul’s concubines and mother to two of his sons. We don’t hear about Rizpah again until long after David is made king, when a famine hits the land. David asks God why exactly there is a famine, and conveniently God answers, “it is because of the bloodguilt of Saul and his house, for he put some Gibeonites to death” (II Samuel 21:1). So King David treks over to the Gibeonites and aks them how he can make it up to them. And they say, “let seven of his [Saul’s] male issue be handed over to us, and we will impale them before the Lord…” (II Samuel 21:6). So David grabs seven men from the lineage of Saul. Five of Saul’s grandchildren, and two of Saul’s sons from Rizpah. These seven men were all impaled up on a mountain, and “died at the same moment” (II Samuel 21:9). But then: Rizpah daughter of Aiah took sackcloth and spread it on a rock for herself, and she stayed there from the beginning of the harvest (around April) until rain from the sky fell on the bodies (Winter); she did not let the birds of the sky settle on them by day or the wild beasts [approach] by night” (II Samuel 21:10). 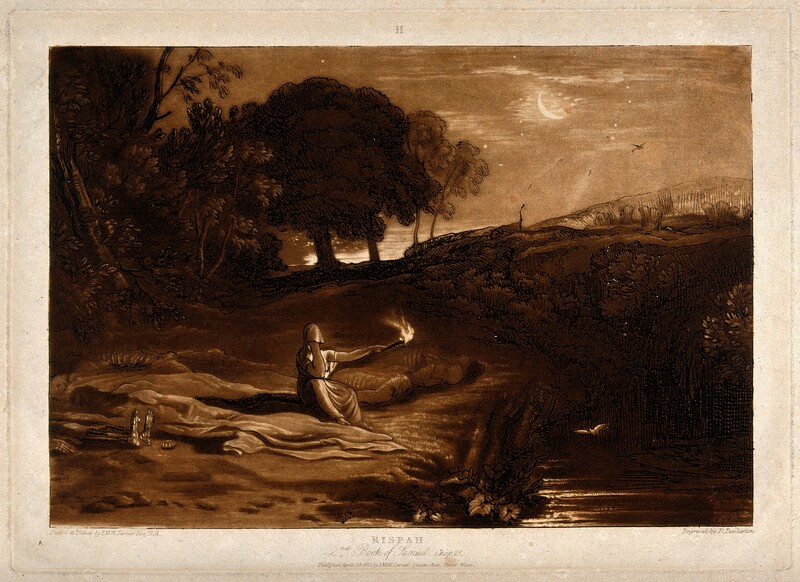 Rizpah, grieving mother, treks up to this mountain and erects a tent to shield her from the beating sun, knowing that she would stay there with the bodies of her sons until they were buried. 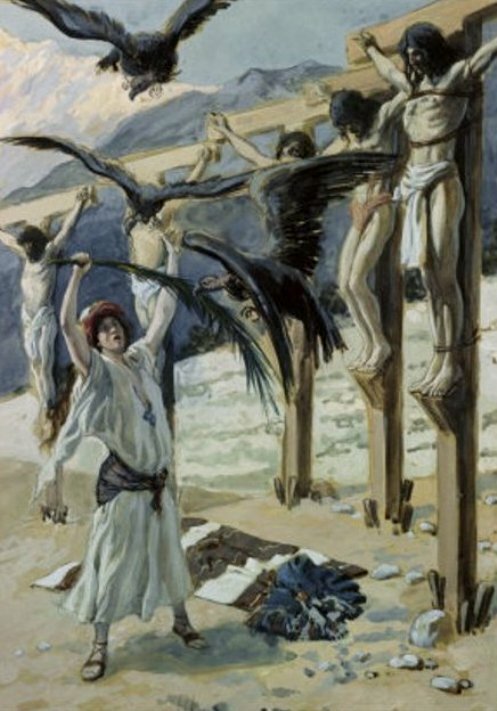 Public hanging, crucifixion, execution, is not just about a painful way to kill someone, but about the public intimidation and repercussions for the living. In this case, King David tried to appease the broken trust with the Gibeonites by killing seven from Saul’s line. That these men were killed on a mountain during the barley harvest meant that they were clearly visible to all. Their bodies were left to decompose and hang for nearly 10 months while Rizpah, mother and grandmother to the men, guarded their bodies from scavenging animals, and guarded them from being alone. So David fetches the bones of King Saul, and of Jonathan (Saul’s son and canonically David’s one time lover). Their remains were seized and dispersed after the public execution of Saul. David took the bones of the men who had been impaled but guarded by Rizpah, and buries them all in David’s own father’s tomb. And just like that, the famine is over. It was not the death of these seven men that ended the famine, but David returning the bones of Saul and his lineage–three sons and five grandsons, to a grave, that ended the famine. It was this realizing that bodies are not just a pile of bones and flesh when they die, but people, children, parents, worthy of care. Rizpah is not an agitator here, fighting with David to take down the corpses of her family. She is a shomeret, a guardian. It is this deep kindness and respect for the dead that agitates the great King to seeing the same. There is deep concern for the unburied dead, the dead who are not given rest. For their families, and themselves, we fear a world without closure. Shomrim, guards, sit with the deceased from the time that they die to the time they are buried–in Jewish tradition, the body is not left alone ever. Many reasons fit here, be it guarding the soul of the deceased and helping usher them to another state of being, comforting the soul that is in pain and grief at the death of its body, or guarding the physical form from desecration. Shomrim read Psalms, or poems, or songs to the deceased–for the deceased? And remain present around the clock. Like Rizpah, presence is a non-negotiable part of guarding. High on the mountaintop, Rizpah responded to all who might gaze on her family and cast judgement, and defended their dignity. Rizpah, a concubine of the fallen King Saul, who wielded stick and sword and sight and presence, is the foremother of shmirah, guarding. A woman whose action defends her own kin and motivates the great king is honored in the text–text that was so ready to discount her as merely a pawn for wargames and reproduction. Rizpah is a model for us today as we see mothers fighting for the dignity of their children, for timely burial, for the honor due to the lives these children lived, and to the brutality they suffered in death. The Mothers of the Movement for Black Lives, the parents of young black men and women slain by police brutality, mirror this legacy of Rizpah–fierce protection of the dignity of her children, and demand for the world to witness what has happened. Through washing, dressing, guarding, we prolong the time of the dead on earth. We protect them from harm, from a culture that denies death, from the disregard for the dead. Like Rizpah, through shmirah, guarding, We can all stand on the mountaintop, wielding swords, fending off the vultures. Metaphor or no, Rizpah’s grief beneath her heroic efforts to maintain the dignity of her sons and grandsons in death is too painful even to imagine yet too important to ignore.